We tested the most pinned dinner recipe! Do you have it on your board? Many a Sunday afternoon I have made the resolution to start cooking real meals for the coming week. I tell myself that I am going to say sayonara to frozen meals. 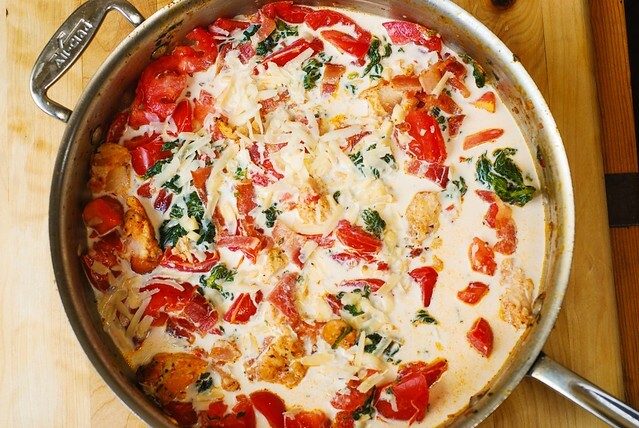 I set aside time to spend pinning delicious looking recipes to our boards. However, as I flick through my selected meals for the day, I realise that a weeks’ worth of meals might be a tad bit hard to achieve. This usually takes place as I realise I don’t have a ‘teaspoon of orange ginger hummus’ tucked away in my pantry behind my tomato sauce. But this year, I made a resolution to seriously take on the pots and pans once a week! After a few failed baba ganoush’s, and a disastrous kale salad, I decided to lower my expectations a little. When posed with the intimidating search bar of Pinterest, I chose to make a smart move – I typed in “easy dinner recipes”. 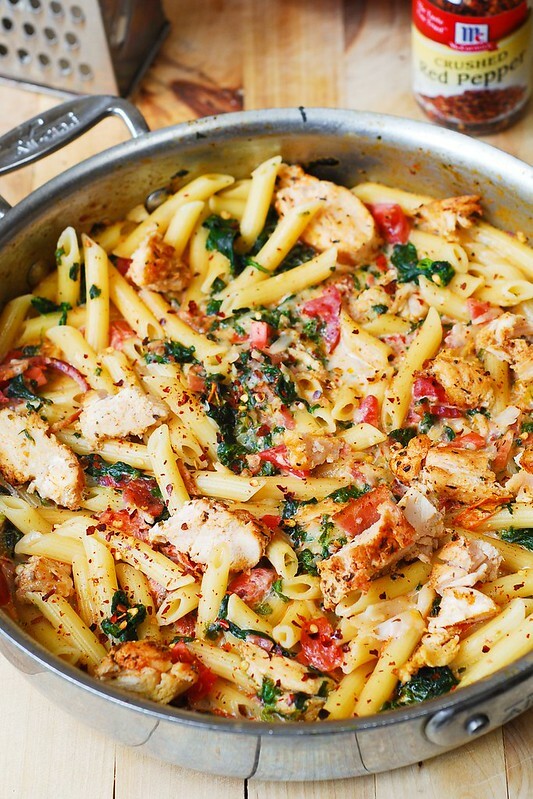 After scrolling through a few pins that obvious did not understand the definition of ‘easy’, I stumbled across a recipe for ‘Chicken and Bacon Pasta’ - and what’s more, it was the highest pinned dinner recipe with a whopping 100,000+ pins! I figured that if 100,000+ people had pinned it, at least a few of them would have failed so the pressure wasn’t too high. 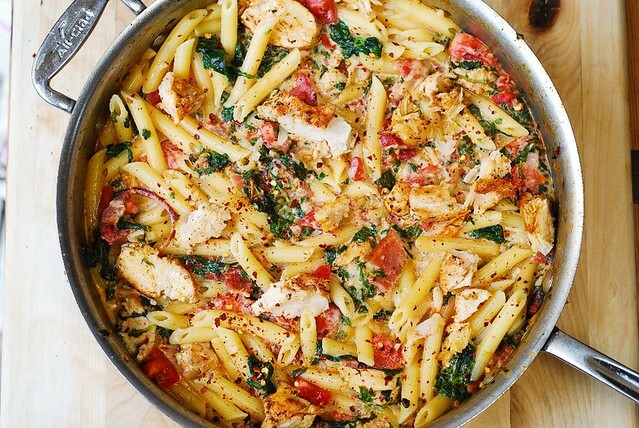 The original recipe was titled “Chicken and bacon pasta with spinach and tomatoes in garlic cream sauce” and was originally published on Julia’s Album. I shopped for the ingredients, and surprisingly, only needed to buy the meats and a few spices. The steps to the recipe were clear. I cooked the chicken with the seasoning in my pan, removed the chicken, and threw in some tomatoes, spinach, garlic, and red pepper. I then stirred in the chicken, bacon, the milk and cream, let it come to a boil, stirred in the pasta – and that’s it. I know. I was surprised it was done so quickly myself! Well, I was more surprised I hadn’t set off any smoke alarms, but I was still quite amazed that I was able to finish. And, get this – it actually tasted good! It was creamy, well-seasoned, and filling. This recipe is easy, tasty, and won’t make you want to throw a spatula out the window – and this is all coming from a bad cook.